Fancy a crack at some competitive (but friendly) singles play? 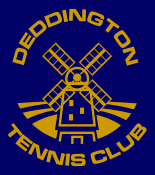 We’re conscious that at Deddington Tennis Club (like the majority of clubs) the predominant format of the game is doubles. That suits most of us very well but if you’re someone that prefers singles (or just fancies a crack at it) then our recently launched Mixed Singles Ladder is for you. Men and women of all ages are welcome to join – the beauty of a ladder is that it tends to find a natural order and so those nearest to you in the ladder are likely to be of a similar ability. We’re also keen to encourage our younger players to get involved too, so as long as you’re playing yellow ball tennis on a full size court you’re welcome to take part. For players under 16 years old we’ll probably ask to register a parent/guardian’s contact details. Matches are played as the best of 3 sets. If you would like more information, or would like to join the ladder, simply email Ed Toll here . He will add you to the ladder and you’ll be able to start challenging straight away.